During the winter months, the RainyDayKitchen folks can’t grill outside. Well, they can, but they are whimpy and choose not to. Because, you know, brrr. Instead, they have been using the Sansaire Searing Kit to get that grilled flavor on meats and vegetables. 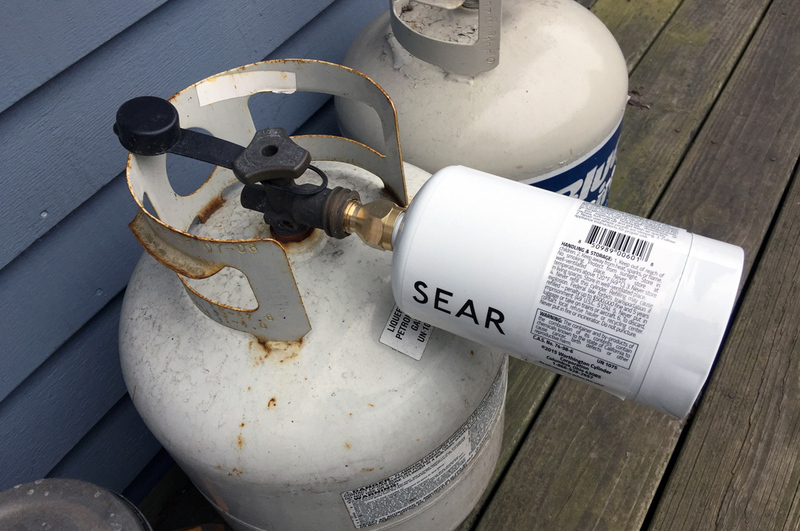 While the cooking was convenient and results delicious, they got tired of throwing out those 1-lb propane canisters and thought there must be a way to refill them. 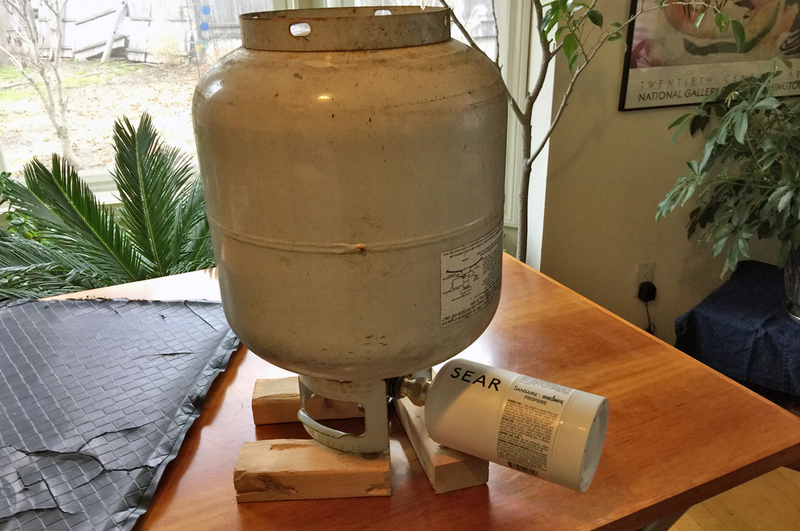 Well, there is…with a tank-to-canister adapter!!! We got ours from DozyAnt on Amazon. The turquoise-colored cap is to remind people of barbecuing in Florida. We think. The tank-to-canister adapter (above) works like this: left end screws into the tank, right end mounts to the canister. In other words, the adapter screws into the tank, and the canister screws into the adapter. works with 20- to 50-lbs tanks and 1-lb canisters. 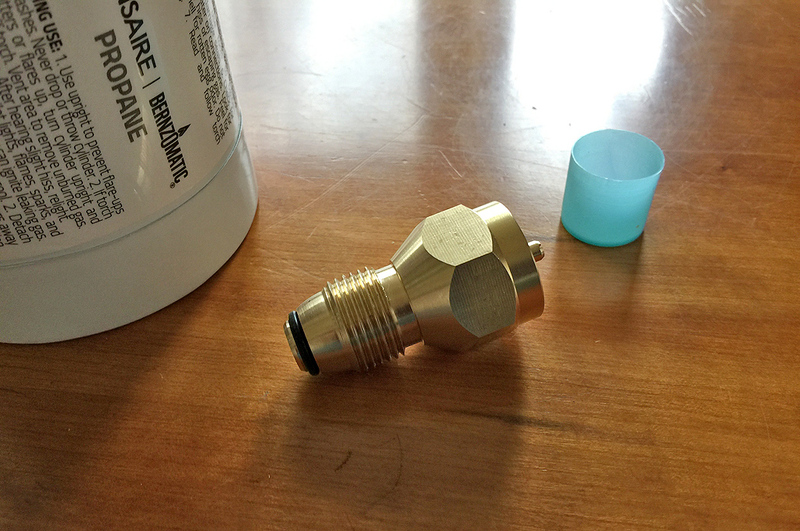 The adapter allows the propane to flow in one direction only. Yes, exactly like the shin bone being connected to the knee bone. The above setup, which was our first attempt, did not transfer the propane between receptacles. We finally put our science hats on (and I don’t mean the metal colanders) and determined the following: the large tank had been sitting outside in the cold; the small canister had been sitting inside the house; the 30º temperature difference created enough of a pressure difference to prevent the flow. The veggie sausage patties had no bearing on this situation. 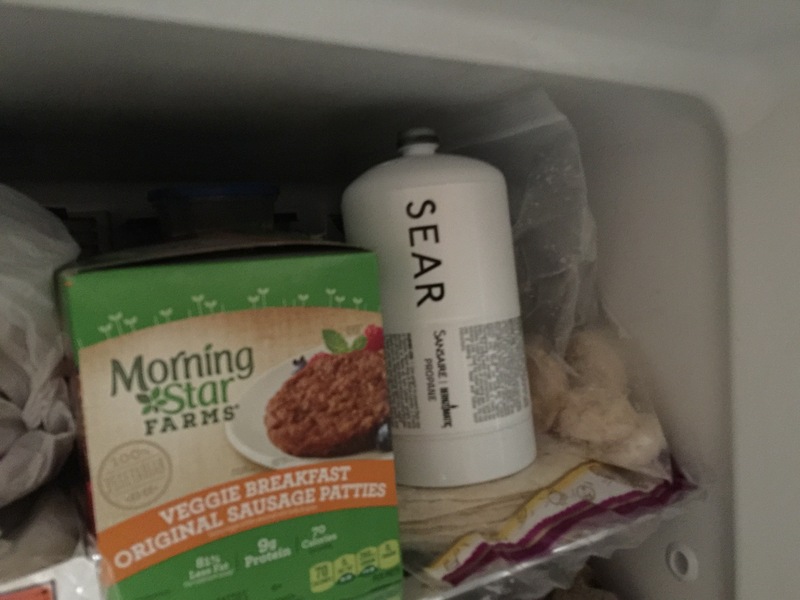 Our solution was to put the canister in the freezer overnight to bring down its temperature. We also brought the larger tank in to let it warm up. With the adapter screwed into the larger tank and the smaller canister attached, we have the same setup as when we first tried the refilling outside, only the temperature differential was now reversed. Propane is heavier than air. Now you know. To help the “flow,” we inverted the tank before opening the valve. 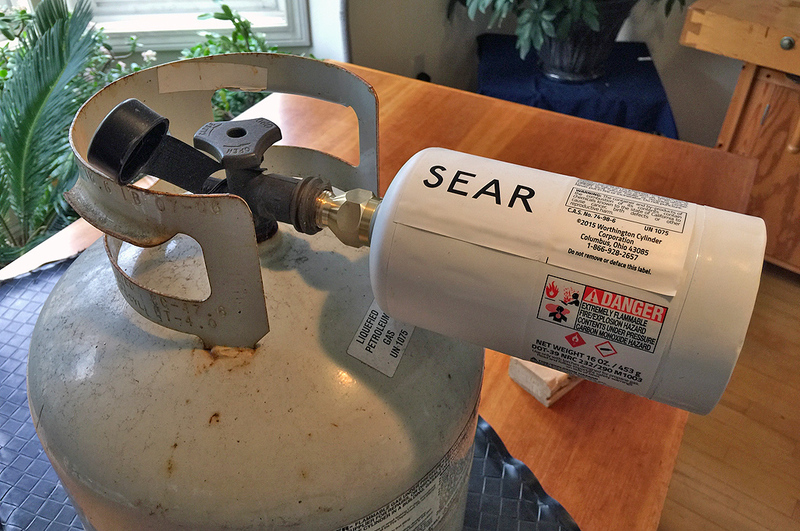 After turning the knob we immediately heard a hissing sound; either the propane was flowing into the canister or there was a leak. As we were not able to detected any propane odor, we decided that the transfer was working. After about 3 minutes, the hissing stopped. We assumed that it was because either the canister was full or the pressure was such that no more flow could occur. In any case, it was time to close the valve on the tank and disconnect the canister. Once disconnected, we were able verify that the 1-lb canister was noticeably heavier than before. We are calling this DIY project a success!